Early Arrival, Destabilization, Exploration, Return to Normal life, and Decompensation. the failure of an organ (especially the liver or heart) to compensate for the functional overload resulting from disease. the failure to generate effective psychological coping mechanisms in response to stress, resulting in personality disturbance or disintegration, especially that which causes relapse in schizophrenia. 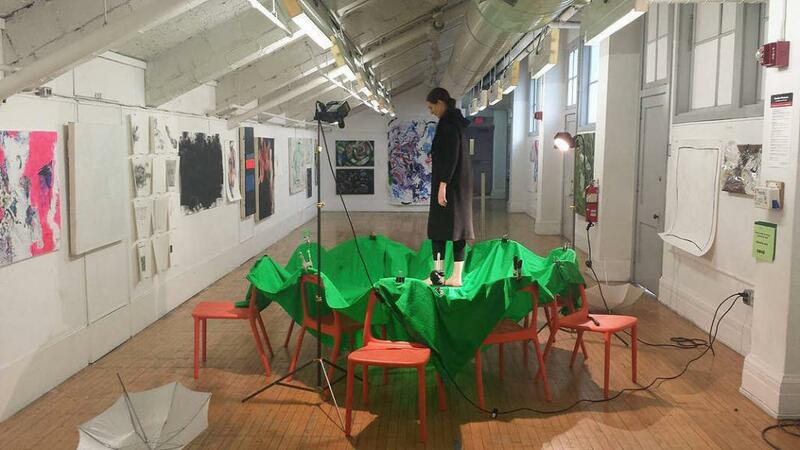 In this participatory piece, the notion of “Displacement” is communicated through music, performance, and 360-degree video. 3. Immersion in the virtual world of the performer. An immersive perspective provided by virtual reality is hoped to inspire an empathy for the displaced individual. Therefore, VR aims to function as a type of empathy machine in which the immersive quality enables a sensory experience. The work displaces the viewer in order to contemplate the displacement of the refugee. The immersive experience provided by virtual reality can increase empathy, through sensory experience. By activating the body and the senses, virtual reality brings new topologies of emotion, pleasure, and passion to the landscape of interaction. Laura Stokes is a Pittsburgh-based movement artist and educator. Her greatest curiosity is how artistic movement practices and creative physical play affect the human condition from early childhood through adulthood. She aims to help integrate creative artistry and physicality into the educational world by dissolving dichotomies around the role of the body in learning. 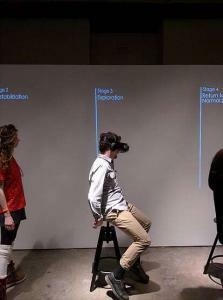 Laura’s collaboration with visual media artist Nima Dehghani on Decompensation, was her initiation into the world of choreographing dance for virtual reality. Other most recent projects include: El Eswitch, a choreographed solo exploring the dynamics of code-switching in language and culture; co-creating and teaching The Contact Lab, workshops in Contact Improvisation with Jean-Paul Weaver; and her ongoing dedication to developing innovative creative movement classes for children. Laura holds a B.A. in dance from Slippery Rock University in Pennsylvania. Nima Dehghani is a multidisciplinary artist, writer, and architect. Born in Tehran, Iran in 1986. Humans, communication, individual conflicts and social discriminations with allusions to politics, have been the subject of most of his works. With a background in architecture and theater, he strives to build the most comprehensible virtual venues to convey his thoughts, to focus on the notion of displacement, home, diaspora and the purest relationship between human and space: Migration. Nima works predominantly in the medium of performing arts and digital media and his goal is to find the most effective ways to influence the audience using new media. His research revolves around the core of Middle Eastern studies, social behavior in online networks and performativity of social actions. Nima got his BA’s in Architecture from University of Science and Technology in Iran, and then moved to the US to get his Master of Fine Arts degree from Carnegie Mellon University with emphasis on digital media and performance. Most of his past works have been performed or shown in Iran before 2013, and after that mainly in the US and different festivals in Spain, UK, Belgium, Czech, Georgia, and Germany. As a playwright and director, Nima has won several awards, the last one before he leaves Iran was “The best young director of the year” in 2012. Decompensation screens at FIVARS 2016 September 16-18th, 2016 in Toronto, Canada.